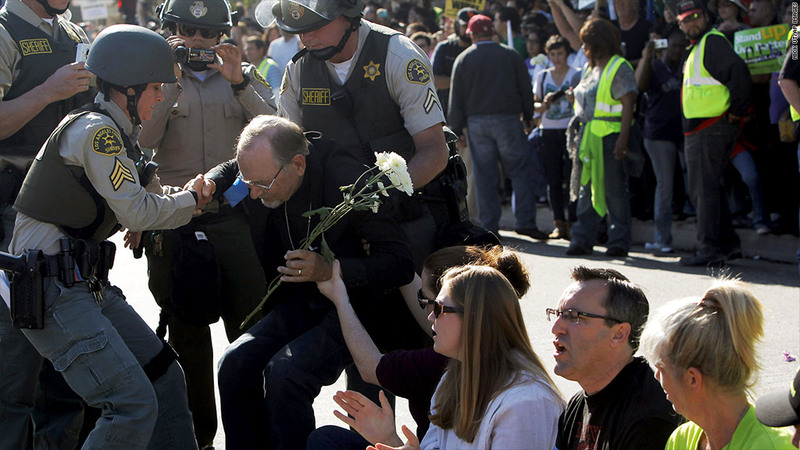 Demonstrators protesting outside a Walmart in Paramount, Calif. are arrested during a 2012 Black Friday protest. Protesters took to the streets near a number of Walmart locations again this year. In a tradition that's becoming as much a part of Black Friday as the shopping, protesters gathered outside a number of Wal-Mart locations Friday calling for higher wages at the country's largest private retailer. Ten people were arrested on misdemeanor charges Friday at a protest near a Wal-Mart in Ontario, Calif., after they moved into an intersection and failed to disperse, Ontario Police Department Sgt. David McBride said. McBride called the incident "peaceful," and estimated that between 100 and 150 people had attended the rally. It was unclear how many of those were actual Wal-Mart (WMT) workers. Another 10 people were issued citations at a protest near a Wal-Mart in Chicago for blocking a roadway. Protests also occurred in cities including Alexandria, Va.; Quincey, Mass. ; Orlando, Fla.; Bellevue, Wash; Lakeside, Colo.; and Hyattsville, Md. The protesters are calling for Wal-Mart to pay full-time employees at least $25,000 per year, and to increase opportunities for full-time work. Wal-Mart currently employs 1.2 million hourly associates who earn an average of about $12 an hour and are also eligible for up to $2,500 a year in quarterly bonuses, spokesman David Tovar said. Of that 1.2 million, "over 50%" are full-time employees working an average of 37 hours per week, Tovar said. Workers are considered full-time at Wal-Mart if they work 34 hours or more per week. The company's part-time workers average about 27 hours a week. Over 475,000 of the company's associates earned $25,000 or more last year, according to a Wal-Mart presentation from September. Protest organizers claimed rallies took place at 1500 locations Friday. Tovar said that number was hugely inflated, and that very few demonstrators were actual Wal-Mart employees. Friday's protests were organized by OUR Walmart, a group backed by the United Food and Commercial Workers Union. OUR Walmart and the UFCW do not represent Wal-Mart workers, and say their goal is only "helping Wal-Mart employees as individuals or groups in their dealings with Wal-Mart over labor rights and standards." OUR Walmart held similar protests last year. Last week, the National Labor Relations Board said it was ready to bring a case against Wal-Mart for allegedly retaliating against workers who took part in those protests. The NLRB, which protects the rights of workers who organize for better working conditions, alleged that Wal-Mart stores in more than a dozen states "unlawfully threatened, disciplined, and/or terminated employees" who participated in legal strikes and protests. Speaking to CNN Friday, Wal-Mart U.S. CEO Bill Simon denied the NLRB accusations and defended the company's labor practices, saying its pay is above the median for the retail sector. 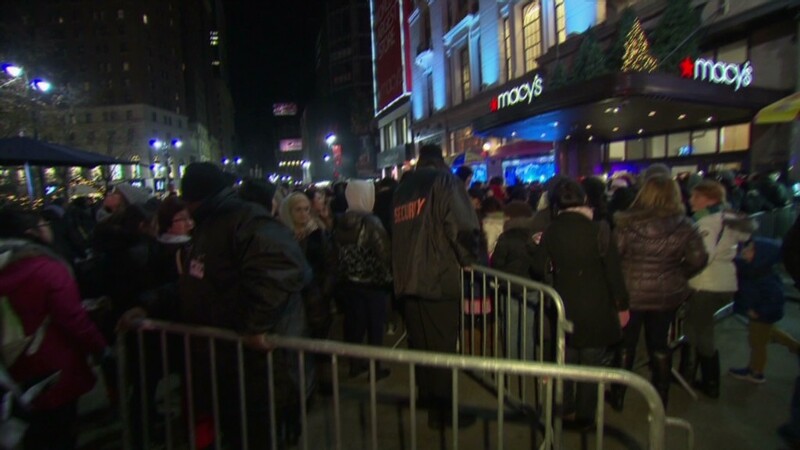 "Black Friday...is the big stage and Wal-Mart is a big player on the big stage. Those who want to try to change an industry like retail, it's not unexpected that they would be out on Black Friday at Wal-Mart with something to say about it," Simon said.